MAD GIGA Wired Game Controller is a high precision gamepad, offer your the best experiences of gaming! Hold down any button you need to fire rapidly, press TURBO once, then you can fire in succession without pressing repeatedly. Give the TURBO button a press to call it off. 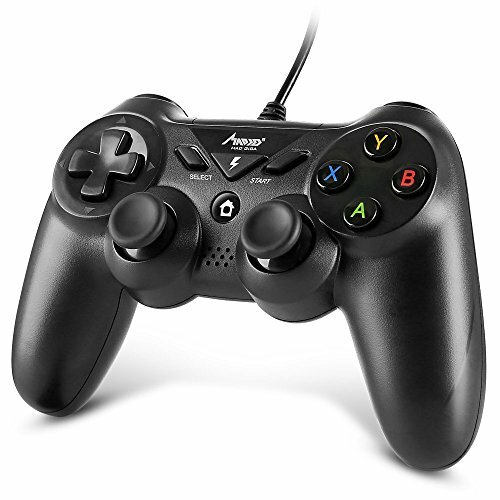 DUAL VIBRATORS GAMEPAD CONTROLLER -- Vibrating motors are embedded in the side grips and deliver distinct feedback during the game, enhancing the immersion and realism of the game scenarios. PLUG & PLAY GAME CONTROLLER -- Wired gaming controller offers stable connection during playing games and 2M long cable (6.5FT) allowed a bit far away from the console. WIDE COMPATIBILITY PHONE CONTROLLER -- PS3 controller, also works with PC (WindowsXP/7/8/8.1/10), phone, Android, TV Box, Vista. DO NOT compatible with iphone, XBOX ONE/360. ERGONOMICS DESIGN -- Asymmetrical design of the joysticks is based on ergonomics and designed for the most comfortable thumb position. Ensure you optimal feeling when playing. 3D REMOTE SENSING -- 360°global high-precision positioning, high sensitivity, high precision and turbo button bursts. Enjoy your gaming!